Prague is a great city to get lost in, which is entirely possible if you are like me and don't have phone service. If lost, you're bound to find your way through the city by public transit, or you can just use the time to relax and check out some beautiful architecture. After being in Vienna and Ljubljana, though, I was surprised at the city's absence of bicycles and perceived bias towards cars; not very progressive, considering their neighbors. So while Prague is winning in the public transit department, the car-vs.-bike department leaves much to the imagination and here I'm listing four ways in which the city is winning and four opportunities for improvement. 1. Public transit. Prague is well-equipped transit-wise, offering metro, trams, and buses. Each mode is easy to use, clean, and very inexpensive. The best part? Pets can ride with you with a purchased pet ticket and wearing a muzzle, although neither requirement seem to be enforced. The "retro metro" reminded me of the DC Metro's modern architectural style. 2. Car-free zones. You'll find many parts of Old Town to be pedestrian-only or allow for a limited number of cars, which makes the pedestrian experience that much better. Taking in the colorful buildings, grand art galleries, and whimsical astronomical clock of the Old Town Square without having to fight cars is enlightening. 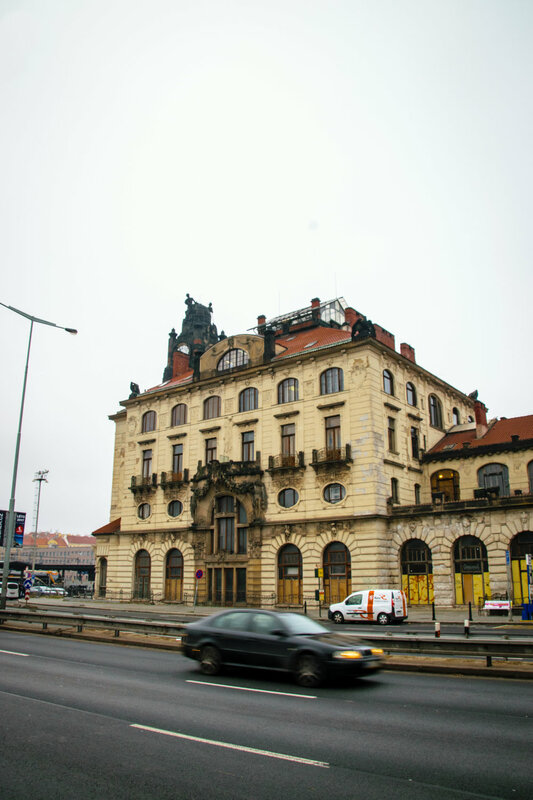 "Investment in the maintenance and repair of the historic center of Prague was interrupted as early as the thirties, due to the economic crisis. After a short period of enthusiasm after WWII the main priorities of the Communists turned towards the building of heavy industry thus limiting reconstruction of Prague to the exceptionally expensive Stalin monument. After three decades of dilapidation the condition of the city center was becoming unbearable. Lofts were decomposing under leaky roofs, ceilings of residential flats were falling down, facades were chipping away and most balconies threatened with falling down as well... The Party only began to organize repairs of roofs and facades in the most precious historic localities before the mid-sixties." 4. Accessibility. Since the 1980s, Prague has been significantly investing in making its public transit accessible to the physically handicapped and visually impaired. Now all of the buses have low floors and announce the number and destination of approaching vehicle. What really impressed me in the city, though, was great use of tactile paving for seeing-impaired walkers. 1. Increase bikeability. Interestingly enough, Prague does have a bikeshare program. Also interestingly enough I didn't see many cyclists or bike lanes. But considering the city traffic and exhaust from idling cars, I don't know if I'd be too excited to cycle around Prague. 2. Make streets more pleasant for cyclists and pedestrians. The city streets seem to be made for cars, from the unfriendly metal rails that kept pedestrians from jaywalking to wide inner city highways. There always seems to be traffic in Prague and pedestrian crosswalk times are way too short for my liking (tisk tisk). Car drivers were courteous to pedestrians though, especially those of the tourist variety, ahem. 3. Stop burning coal! In many Prague homes, residents still burn coal for heat because their furnaces are too historic to be retrofitted (or at least what the tour guide said). Heating with coal creates air pollution, grimy buildings, and a thick morning haze over the city.